Begin to create your necklace by stringing a pretzel to one end of the string or ribbon. Create a knot on the pretzel to secure the end. Now string the rest of the ingredients. Have fun by creating a pattern or a free-flow a design. Once you've reached your desired length, tie onto the anchor pretzel. Serve and enjoy after school or anytime your kids need a fun, quick snack! Have your little ones help create this recipe and you’ll also be working on their fine motor and pattern-making skills! When kids get out of school, they’re usually on the hunt for food. After-school snacks are a staple for most households and a good opportunity to fill your young ones with the added fuel their body craves. 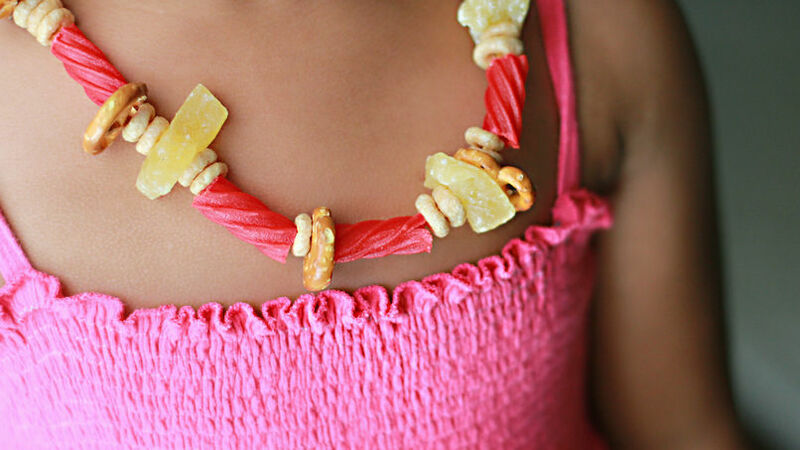 This after-school snack necklace recipe is a fun, easy and wholesome snack alternative. Pick items that provide fiber or vitamins, combined with a few special treats that your child will enjoy. They’re also portable, making snacking on the go easy!